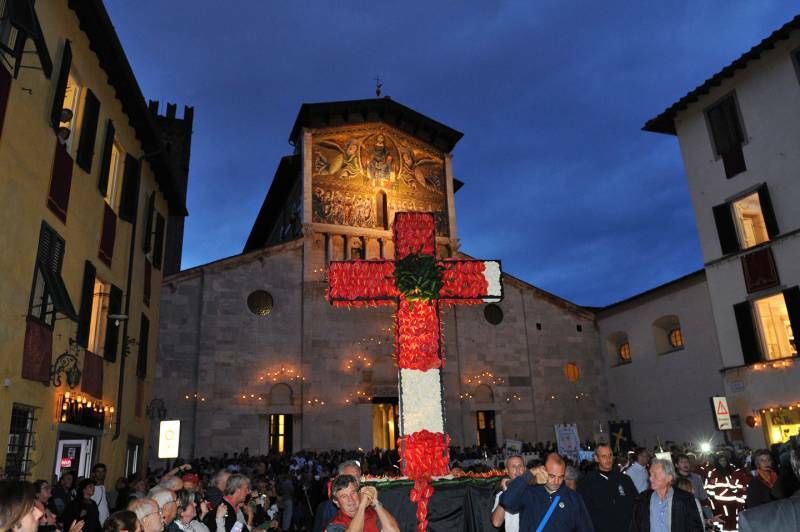 The Festa della Esaltazione della Santa Croce, Feast of the Cross, is the Roman Catholic Archdiocese of Lucca’s main festivity. The feast commences during the vespers on September 13 and proceeds for the entire day of the 14th. 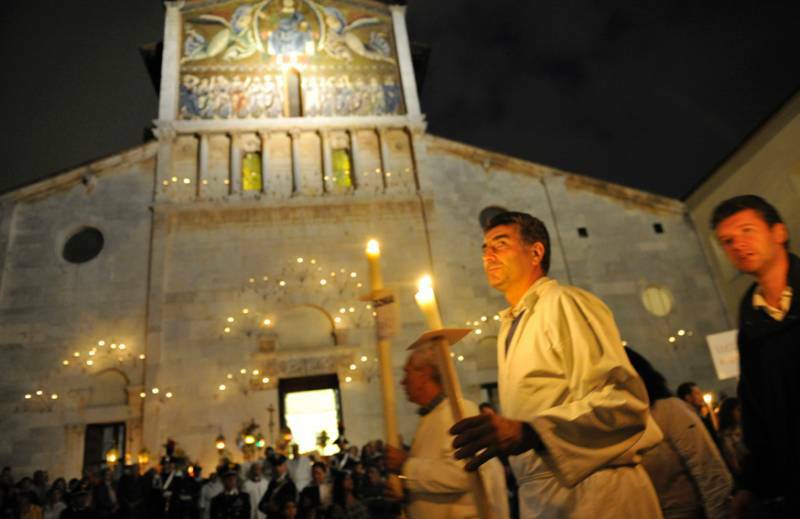 This event is well renowned above all for its nocturne candlelight procession called La Luminara. The particular emphasis on this celebration is due to the millennial worship of the Holy Face of Lucca, the venerated wooden crucifix preserved in Lucca’s Cathedral. 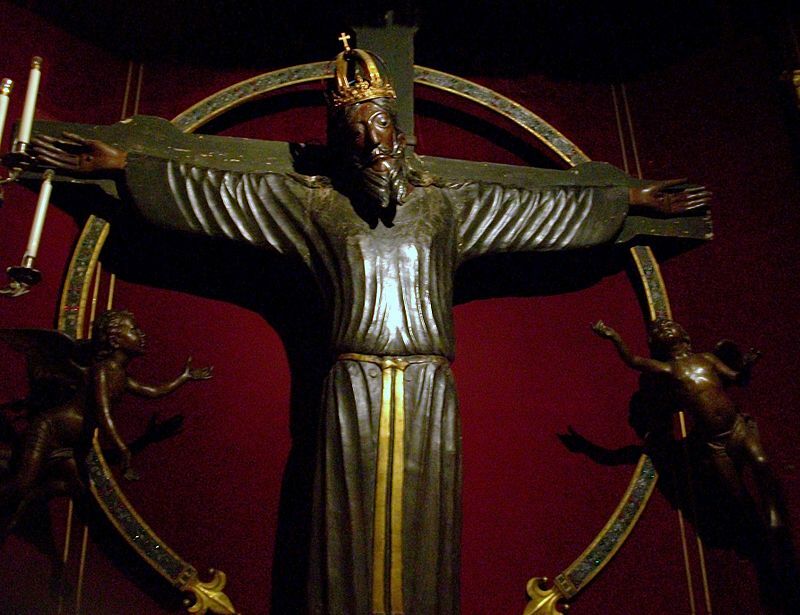 Medieval legend has it that the crucifix was sculpted by Nicodemus, who assisted Joseph of Arimathea to prepare Jesus’ body for burial, and specifically dates its arrival in Lucca to AD 742. Actually, the present Holy Face is an early 13th-century copy of an original ascribed to the circle of Benedetto Antelami. The original had apparently been ruined beyond repair by relic-seeking pilgrims. However, its presence in Lucca is only securely documented around about 1100. What is certain is that the procession to celebrate the Holy Face was first mentioned on September 14th 1118. 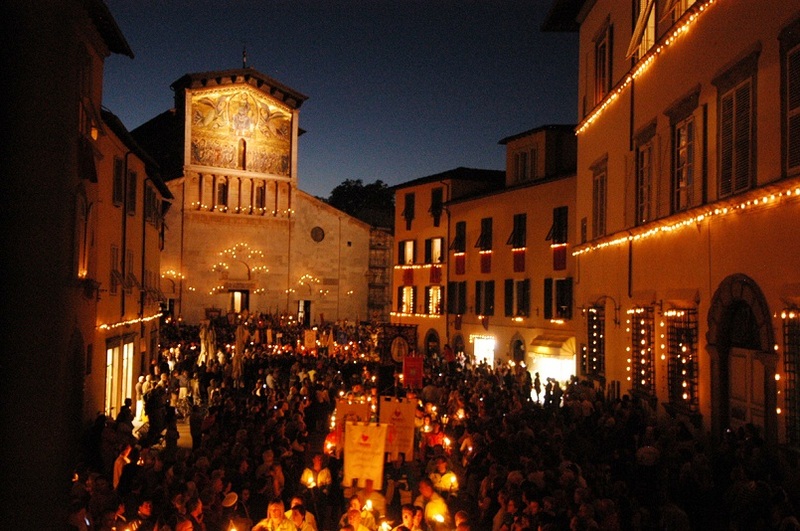 Around this date the festivity became Lucca’s main celebration, and the participation of town-dwellers between the ages of 14 and 70, was made compulsory. 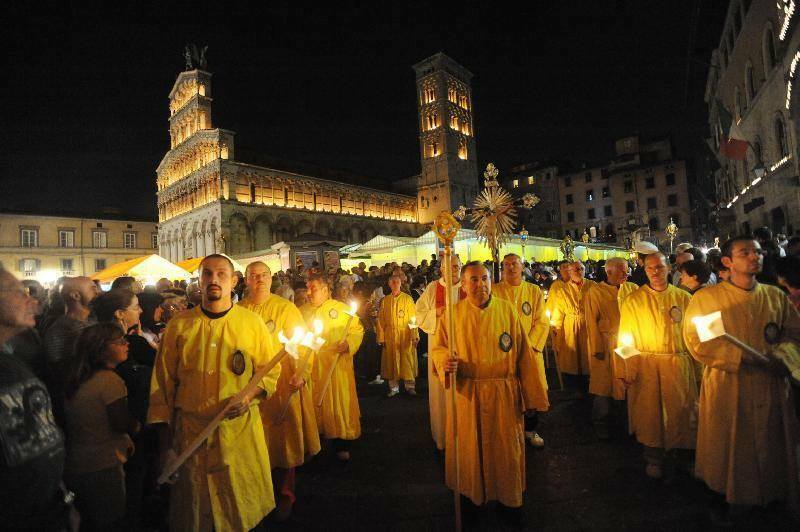 The procession follows the original itinerary the relic covered when it was brought to Lucca from Luni, also known as the “percorso miracoloso”, the ‘miraculous path’. Originally, in fact, the Holy Face was deposited in the Church of San Frediano to be worshiped. The following day, however, the Cross was mysteriously discovered in a kitchen garden next to the Cathedral of San Martino. This event was interpreted as a precise indication of the Holy Face’s will and since then the relic hangs in Lucca’s Cathedral. So if you’re travelling around Lucca in the middle of September we highly recommend you come see the procession. A rare opportunity to witness a millenary tradition in a suggestive atmosphere with thousands of candles decorating the surrounding buildings and borne by the participants themselves. Questa voce è stata pubblicata in Events in Lucca, Lucca, Tuscan churches and cathedrals, Tuscan traditions e contrassegnata con Feast of the Cross, Festa della Esaltazione della Santa Croce. Contrassegna il permalink.